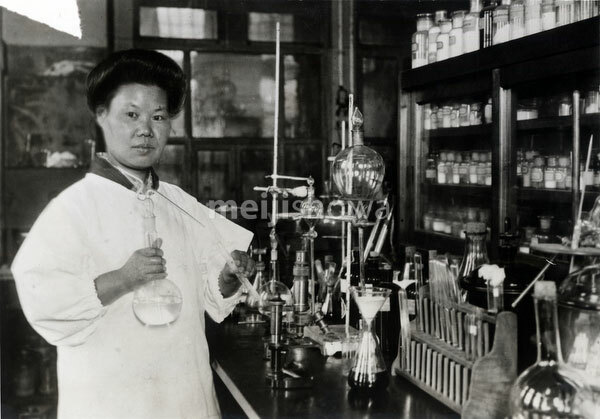 Michiyo Tsujimura (1888–1869) at work at her research institute in Tokyo, 1930 (Showa 5). Japan’s first female doctor of agriculture (初の女性農学博士), Tsujimura researched the components of green tea. She was born in Saitama Prefecture and studied under Kono Yasui (保井コノ, 1880–1971), Japan’s first woman to earn a doctorate in science. Later, Tsujimura conducted research under Umetaro Suzuki (鈴木梅太郎, 1874–1943), the Japanese scientist who discovered vitamin B1. In her joint research with Seitaro Miura (三浦政太郎), she identified vitamin C in green tea. This discovery contributed to an increase in green tea exports from Japan to North America. In 1929 (Showa 4), Tsujimura was the first person in the world to isolate and extract catechin (カテキン). The following year she also extracted tannin (タンニン) in crystal form and determined its chemical structure. Based on this research, Tsujimura earned her doctorate in agriculture from Tokyo Imperial University in 1932 (Showa 7).